Posted by Dave Emory ⋅ March 20, 2014Post a comment Email This Post Print This Post Tweet This! COMMENT: Continuing our coverage of the OUN/B’s political heirs ascension to control of Ukraine’s government and politics, we note two more stories about Swoboda. Along with Pravy Sektor, Swoboda constitutes the OUN/B constituency that dominates Ukraine today. An article in Germany’s venerable Der Spiegel informs us that, in addition to the relationship between Germany’s top neo-Nazi party and Swoboda, the latter has interfaced with, and received support from, Germany’s ambassador to the Ukraine and NGO’s associated with Angela Merkel’s CDU. The Orwellian coverage of the Ukraine continues, with the absence of coverage in the West of a stunning, representative action by Swoboda parlimentary deputies. Angered by a state television station’s broadcast of Vladimir Putin’s speech announcing the absorption of Crimea into the Ukraine, several Swoboda parliamentary deputies assaulted him and forced him to sign a paper of resignation. “Tight on the Right: Germany’s NPD Maintains Close Ties to Swoboda” by Steffan Winter; Der Spiegel; 3/17/2014. ENTIRE TEXT: When Holger Apfel showed up at the Saxony state parliament with a “parliamentary delegation” from Ukraine last May, few had even heard of a party called Svoboda. Apfel, who was head of the right-wing extremist National Democratic Party of Germany (NPD) at the time, proudly showed his guests — Ukrainian parliamentarian Mikhail Golovko and two municipal politicians from the Ukrainian city of Ternopol — around the parliament building in Dresden. With a view to approaching elections for the European Parliament Apfel added that an “opposing model to the EU dictatorship of Brussels Eurocrats” must be established and said that EU officials were nothing but “willing helpers to international capital.” Svoboda, he exulted following the visit, is part of the “phalanx of patriotic powers” and encouraged the “intensification of cooperation.” Apfel’s Ukrainian guests agreed, saying that collaboration between the NPD and Svoboda should be expanded. Given such ties, it is astounding that Germany has approached the Ukrainian right-wing extremists in a manner that would be unthinkable with the NPD. On April 29, 2013, for example, Germany’s ambassador in Kiev met with Svoboda’s parliamentary floor leader Oleh Tyahnybok. During the meeting, Berlin has insisted, the ambassador exhorted Tyahnybok to respect the inviolability of human dignity and human rights. But the Ukrainian right wing has also received instruction financed by German taxpayers. Party members appeared at events hosted by the Konrad Adenauer Stiftung, the German political foundation affiliated with Chancellor Angela Merkel’s conservatives. Examples include the conference entitled “Lessons from the 2012 Parliamentary Elections,” the seminar series called “The Higher School of Politics” and a discussion on the 2012 elections. Even the German Society for International Cooperation (GIZ) has supported the party. GIZ oversaw a project for the “formation of administrative capacities in the public financing sector.” Svoboda parliamentarians took part in two trips to Berlin in 2013 in conjunction with the project. One prominent party member even gave an interview in early May 2013 to the NPD publication Deutsche Stimme. In an interview conducted by senior NPD member Jens Pühse, Ternopol Mayor Sergei Nadal was asked why Svoboda supports the recognition of descendants of former members of the Ukrainian 14th Division of the Waffen SS as national heroes. “These Ukrainian heroes must be honored irrespective of what has been written about them in the history books of those peoples who were once our enemies,” Nadal answered. Germany’s Interior Ministry has also taken note of the Svoboda-NPD connection. In response to a parliamentary query from the Left Party, the ministry noted that the NPD had established a department tasked with maintaining contact with right-wing extremist organizations in Eastern Europe. The German government, the ministry said, considers Svoboda to be a “right-wing populist and nationalist party” which represents “in part right-wing extremist positions.” The party, for example, organized a rally to mark the 70th anniversary of the founding of the 14th Waffen SS Division. 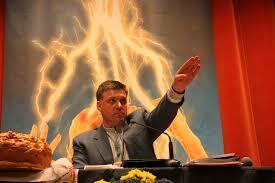 Svoboda, meanwhile, has established chapters in Frankfurt, Cologne and Munich. The Anti-Fascist Information Center in Munich noted recently that in August of last year, some 40 participants gathered in a Catholic parish hall to elect a Munich student of Ukrainian descent as their chairman. “Nation­al­ist Svo­boda Party mem­bers of par­lia­ment assault First Chan­nel TV man­ager” by Olga Rudenko; Kyiv Post; 3/19/2014. EXCERPT: Sev­eral mem­bers of the nation­al­ist Svo­boda Party scan­dalously assaulted the act­ing CEO of state-owned First National TV chan­nel. On March 18, law­mak­ers Ihor Mirosh­nichenko, Andriy Illenko and Bohdan Beniuk arrived at the TV head­quar­ters with sev­eral other men and forced Olek­sandr Pan­te­ley­monov to quit his post. In the video, which was first pub­lished by Svo­boda spokesman Olek­sandr Aronets and repub­lished by Ukrain­ska Pravda after Aronets removed it, the mem­bers of par­lia­ment are seen ques­tion­ing Pan­te­ley­monov in his office about Per­shiy broad­cast­ing Russ­ian President’s Vladimir Putin’s speech about Crimea sep­a­ra­tion that took place in Moscow on March 18. In the video, Pan­te­ley­monov is seen try­ing to explain him­self and speak­ing politely, while the law­mak­ers sur­round him and shout rudely. Mirosh­nichenko, the lead­ing voice of the group, pro­ceeded to accuse Pan­te­ley­monov of direct­ing an edi­to­r­ial pol­icy aimed at dis­cred­it­ing the Euro­Maidan Rev­o­lu­tion at the behest of the for­mer state author­i­ties and demanded that Pan­te­ley­monov leave his post immediately. Pan­te­ley­monov refused to do so and men­tioned that it was the Cab­i­net of Min­is­ters that con­trolled the TV station. “Cab­i­net of Min­is­ters is over. I’m telling you — write the paper,” Mirosh­nichenko shouted in the manager’s face as he grabbed him and pulled him through the room to his desk. Mirosh­nichenko then pushed Pan­te­ley­monov into his chair, Beniuk held him by the neck and Illienko passed him some paper. As Pan­te­ley­monov refused, Mirosh­nichenko and Beniuk beat him and slapped his face. Even though the video doesn’t show it, the law­mak­ers did force the man­ager to quit. As soon as the video was posted on the evening of March 18, it went viral and the actions of the law­mak­ers were widely con­demned. Many were con­cerned that such actions com­ing from one of the par­ties that were brought to power after the Euro­Maidan Rev­o­lu­tion would fuel Russ­ian pro­pa­ganda that has focused on vio­lence and nation­al­ism in Ukraine. “These are not our meth­ods. The actions of these law­mak­ers are unac­cept­able,” was the reac­tion of Prime Min­is­ter Arseniy Yat­se­niuk, Svoboda’s polit­i­cal ally. The assault was also con­demned by Ukraine’s Inde­pen­dent Media Union. Even Svo­boda party head and Miroshnichenko’s friend Oleh Tyah­ny­bok con­demned the attack. “Such actions were fine yes­ter­day (dur­ing the protests), but now they are inap­pro­pri­ate,” Tyah­ny­bok said in offi­cial statement. After the scan­dal erupted, Svoboda’s Aronets deleted the video and all the eyes turned to the pros­e­cu­tor gen­eral Oleh Maknit­skiy. Also a Svo­boda party mem­ber, Maknit­skiy is now expected to impar­tially inves­ti­gate the assault. On the morn­ing of March 19, Makhnitskiy’s office released a state­ment promis­ing to justly deal with the case. Inte­rior Min­is­ter Arsen Avakov also con­demned the assault and said he was ready to have police help the pros­e­cu­tor general’s office in inves­ti­gat­ing the case. The head of NATO is calling the situation in Ukraine a “wake-up call” on the need for more European defense spending. So, could we be seeing the kernel of the end of EU austerity here? Sure, it would be horribly pathetic if gearing up for WWIII is the one excuse the EU’s leadership can find to end the austerity policies, but could that be what we’re about to see? (Reuters) – The head of NATO warned on Wednesday that Russian President Vladimir Putin may not stop with the annexation of Crimea and said the crisis should serve as a “wake-up call” for European nations to bolster defense spending. Since the end of the Cold War, NATO has shifted its attention to Afghanistan, Kosovo and counter-piracy operations off the coast of Somalia, as well as Libya during its 2011 civil war. The Ukraine crisis has put Russia into focus and sharpened concerns about NATO defense spending. In recent years, austerity-hit European Union countries have slashed spending, scaling back on ships, tanks and fighter jets, and increasingly relying on the United States, which contributes about three-quarters of NATO defense spending. Rasmussen cautioned that European security could no longer be taken for granted and that European states needed to “step up politically and militarily” after Russia’s actions. “The Ukraine crisis and what we have seen in Crimea has been a wake-up call and it must be followed by increased European investment in defense if we are to ensure a credible deterrence and collective defense in the future,” he said. U.S. Vice President Joe Biden said in Warsaw on Tuesday the United States may run more ground and naval military exercises to help the Baltic states bordering Russia beef up their capacity. Rasmussen said he expected NATO to do more in the days ahead. “I envisage further steps to reassure allies, to strengthen deterrence and collective defense, in light of what we have seen,” he said, without offering details. Rasmussen also predicted some NATO assistance to Ukraine would be approved at a NATO foreign ministers meeting in early April, but did not venture into specifics. “I agree we (NATO) should step up assistance to Ukraine and I am sure it will happen,” he said. The United States has agreed to send Ukraine military rations but has not yet approved requests for lethal assistance, like weapons. So less EU austerity via more spending on machines dedicated to blowing up precious resources? Perhaps? Tragedy possibly averted! Lawmakers in the Ukrainian parliament brawled in the chamber on Tuesday after a communist leader accused nationalists of playing into the hands of Russia by adopting extreme tactics early in the Ukrainian crisis. Two deputies from the Svoboda far-right nationalist party took exception to the charges by communist Petro Symonenko and seized him while he was talking from the rostrum. His party supporters rallied to his defense and a brawl broke out with deputies from other parties joining in and trading punches. Symonenko stirred nationalist anger when, referring to pro-Russian protesters who seized buildings in eastern Ukraine, he said nationalists had set a precedent earlier this year by seizing public buildings in protest at the rule of ousted President Viktor Yanukovich. Now, he said, armed groups were attacking people who wanted to defend their rights by peaceful means. “You are today doing everything to intimidate people. You arrest people, start fighting people who have a different point of view,” he said, before being pulled away from the rostrum by the Svoboda deputies.